While looking through this blog, I stumbled upon a link to an Intelligent Design Discussion. Where I learned about an interesting idea, that raises some potential problems with traditional Darwinian evolution. The webpage has an essay written by Biochemist Dr. Michael Behe, who marvels at the complexity of human life and purposes the question, how can, “Darwinian natural selection account for the amazing complexity that exists at the molecular level.” He then says, “Darwin himself set the standard when he acknowledged, "If it could be demonstrated that any complex organ existed which could not possibly have been formed by numerous, successive, slight modifications, my theory would absolutely break down." ” He then goes on to introduce the idea of “irreducible complexity,” which is a biological structure or system which would be a difficult to build with successive modifications, because if you take away one of the parts of the system, the structure ceases to function and is useless. It would then become a vestigial structure, and natural selection would slowly eliminate it. One of the structures which Behe mentions is the flagella of bacteria. The motor flagellum consists of about 40 different parts, but if you took away any one of those parts it wouldn’t function, and would actually become a disadvantage. This raises the question, how could the flagellum (or any other irreducibly complex structure) be formed by successive and slight modifications. I find the concept of irreducible complexity very interesting and wonder why I have never heard of it before. On the website Behe presents his argument and then there is a response by Dr. Kenneth R. Miller, who presents some potential problems with Behe’s argument. Curiously enough there is no response given by Behe on the webpage, but I wondered how Behe might respond to Miller’s argument, or if he even had a response. I asked around and found a whole heap of websites surrounding the idea of “irreducible complexity”. Some supported the idea and some refuted it. I found that one of the main arguments that people had against Behe’s idea was that he hadn’t published any papers in scientific journals regarding the subject, and hadn’t presented the idea for peer-review, which is a common method of testing and critiquing a scientific idea. The frustrating thing, is that he has submitted essays on this topic to science journals, and they will not publish them because of their “controversial nature,” and they admit that they are “aware of the close-mindedness of the scientific community.” Isn’t science about discovering what is true and being open to new ideas?!? Isn’t science supposed to be open to theories which may contradict the current scientific beliefs? Think about Galileo. Are we supposed to accept everything we learn about Darwinian evolution, without thinking critically and having an open-mind. I sympathize with Behe. I find it absurd that a scientific journal can admit to the close-mindedness of a science, when we learn that science is supposed to be about new discovery and finding the truth. I find Behe’s theory about Irreducible Complex structures very interesting. He doesn’t mention God or religion, and he doesn’t appear to disagree that man is decendent from single-celled life, just that it couldn't have occured through "successive, slight modifications," as Darwin put it. I am very discouraged by the apparent intolerance of the scientific community towards any ideas which present arguments against traditional evolution. I encourage everyone to look into it, and post some discussion about his ideas. 1) You are right that science should embrace controversy. I think this is the case for 99% of peer-reviewed publications. When a paper is not published after peer-reviewing it is generally because the authors did not convince the reviewers that their idea or ideas are is worthy. WHY? Mainly because of experimental design (not all experimental designs are intelligent....ah ah!) flaws, interpretation flaws, data that do not make sense, wrong hypothesis or because the idea is to much ahead of its time. 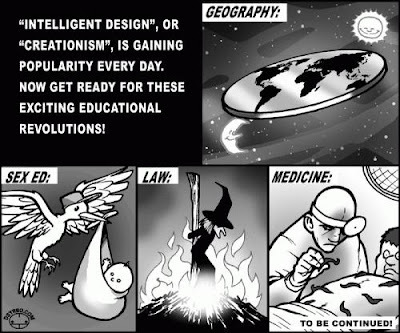 Intelligent design (ID) IS NOT science. It is a theory, a way to see things. If ID proponents can propose and perform experiments I think the opponents of ID will welcome it. They will gladly offer their help....I know I would! 2) I think Behe is probably honest when he says he believe that some systems are too complicated to be explained only by evolution. When I look at the immune system I am amazed by its complexity....but the immune system is evolutive by its very own nature...it has to be, it has to adapt. I am amazed by the way Mother Nature always finds way to create the most amazing things...the diversity of life. Lets assume I believe a "force" created us and the birds and the bacteria etc...why is it so difficult to accept that this "force" uses simple nucleotidic combinations and shuffling to create he diversity. Why is it so difficult to accept that all living things obey the laws of evolution...maybe that "force" wanted it to be like that! I would be interested in talking with Behe and hear him, I would like to ask questions to Richard Dawkins, I like to talk to priests and atheists alike. The most important thing here is to NOT TRY to shove a set of beliefs in someone's throat. dominic b. write: If ID proponents can propose and perform experiments I think the opponents of ID will welcome it. In his correspondence with an editor of a Scientific Journal, the editor admits that he is, “painfully aware of the close-mindedness of the scientific community to non-orthodoxy.” So according to what Behe has written not all of the opponents of ID are welcoming of new ideas. Also, I don't believe that Behe is proposing that evolution doesn't occur, and probably not even that we (humans) evovled from single-celled life, just that this couldn't have occured, as Darwin put it, "through slight, successive modifications." This is where his examples of structures which are irreduibly complex come into play.